It sure would be nice if every crown sent to you not only dropped into place, but also never needed any occlusal adjustment. And while the occlusion should always be perfect on the model, it’s clearly not always like that when the crown is tried in the mouth. I have proven to myself that this is nearly always due to the temporary crown being in place for two weeks rather than for two days (we all know how much occlusal adjustment is necessary if the temp has been in for two months or two years; it’s not pretty). Until the day when all of us can cement crowns in two days (you’ll need a digital impression device), we are going to have to adjust our restorations. Microcopy recently introduced BITE-CHEK®, an articulation paper with a built-in handle that lets you avoid dirtying another instrument. It’s a 19-micron-thick, double-sided black film that marks both arches simultaneously. The built-in handle gets thicker at the anterior to keep your gloves from getting marked. BITE-CHE performs well in both wet and dry situations, and I have found that it marks everything from solid zirconia to cast-gold well. Sometimes the simplest solutions can impact your daily practice. Initially, BITE-CHEK was developed as a new tool to take the mess out of working with articulation film. Now, it has become much more. By adding a handle to the articulation film and eliminating forceps, BITE-CHEK simplifies occlusal adjustment. One obvious advantage is that it removes the need to sterilize forceps. BITE-CHEK is extremely easy-to-use in every operatory, including the hygienist’s. No more searching for forceps buried deep in a drawer. Simply put a few BITE-CHEKs on the tray when preparing for your procedures. Checking occlusion can be done more often with less mess. BITE-CHEK is designed for accuracy and ease of use. 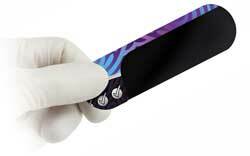 Its thin 19 micron, black double-sided articulation film accurately marks the points of contact, minimizing the possibility of “too high” an occlusion and possible post-operative tooth sensitivity. Contrary to thicker paper, the thin profile helps patients close their bite completely, eliminating mandibular reflexes that can skew the occlusion. The result is a small, accurate mark that makes adjustment easy to interpret. The rounded film is designed to fit into the mouth and the handle is sufficient to hold it straight. The handle makes it easy to position without concern for patients biting metal forceps. The new BITE-CHEK articulation film is the ideal tool for precise occlusal adjustments.